Ben Swift – unlike others on Box Hill, he didn’t get that Team Sky kit for Christmas. 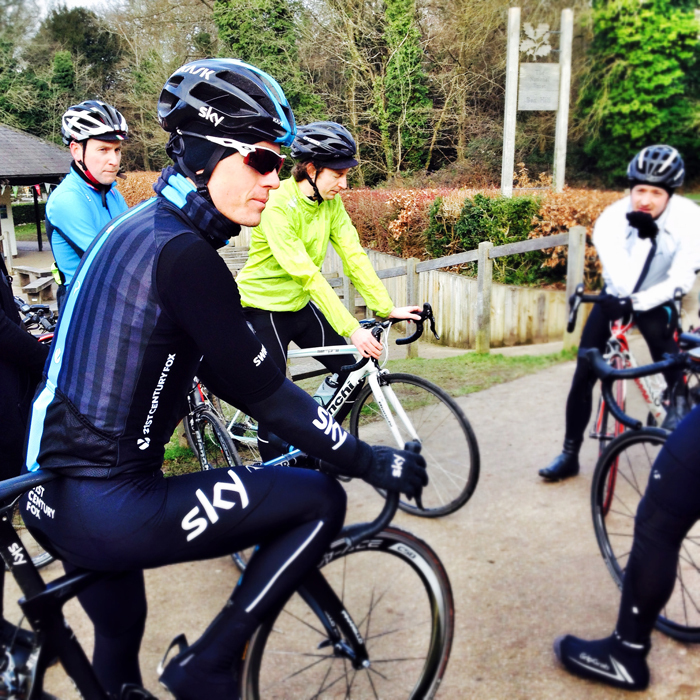 Yesterday I rode a Box Hill climbing masterclass with Ben Swift, Olympian and Team Sky rider. Basically a bunch of cycling journalists and I followed Ben up and down Box Hill, trying to keep up while he tried to go slowly. Then, at the end of the session, we were given a choice: ride Box Hill as quickly as we could (believe me, I’d already done that!) or ride it more slowly with Ben. The assembled male journalists bounded off like greyhounds out of their slips (clearly less star struck than I was!) but it dawned on me that while I had the rest of my life to try to sprint up Box Hill, I had only the next ten minutes to ride it with an Olympian. So as the guys disappeared round the first bend, Ben and those of us who’d chosen to stay behind (me and the other female journalists, read into that what you will) set off to ride the iconic zig zag road at a more laid back pace. We rode side by side, chatting all the way up in informal interview mode. It was a bit like being on a Sunday club ride – except that the rider amongst us wearing the Team Sky kit was actually in Team Sky. Ben was easy going, relaxed and chatty. In fact he talked so much he was a teeny bit out of breath. This was rather charming. The sun came out. If it had been a movie they’d have played The Carpenters. It was ten minutes of ‘I can’t believe I’m doing this’ cycling Nirvana. So what did I learn about myself? That I may not be the fastest rider, but I’m definitely one of the smartest. You can read Ben’s Box Hill tips on Total Women’s Cycling here.